Continuation from the previous 97 parts, the whole series can be found at http://www.nikoport.com/columnstore/. Continuing with the spirit of the previous blog post on the string data type limitations I decided to add a couple more items that are showing some current limitations of the Columnstore Indexes and the Batch Execution Mode and the solutions to solve these limitations. In this post I will consider just 2 items: NULL Expressions and the String Aggregates with MIN & MAX functions. There are more items but I am putting them into separate blog posts, because of their importance and impact. Columnstore & Data Types allowing NULLs – they are ain’t no friends. At all. Notice, that NULLs are a very essential part of the Database, they represent UNKNOWN and for the additive or semi-additive facts, they are essential elements of a good Data Warehouse. It just happens that contrary to the Rowstore Indexes, they can represent significant trouble for the query processing, because they are not being pushed into the Storage Engine and as a result a filter iterator will be included in the execution plan at a later stage, representing greater resource spending (memory & time) until the rows will get filtered out of the execution plan. There are no filters to be found within the execution plan, and the Clustered Columnstore Index scan returns ~857.000 rows, while the original plan had almost 6 million rows being returned and processed. This happens because of the pushed predicate into the storage engine in the second execution plan, as you can see on the left picture. We are doing IS NULL comparison and do not use any NULL expressions, which allows engine to optimise the execution. The execution plan is naturally different, because we have no Columnstore Indexes and no batch mode, but the 857.556 rows being filtered out of the Clustered Index Scan are the good news which can be verified by checking the properties of this operation showing the NULL expression successfully being pushed into the storage engine. The lesson here is simple – be aware that in SQL Server 2016 this is still a limitation and check your execution plans on the NULL expressions and do your best to rewrite them if the query performance needs to be improved. Coming back to the topic of Strings I wanted to add another item to the list of items and solutions described in the previous blog post Columnstore Indexes – part 97 (“Working with Strings”). The issue is that Max & Min aggregations on the strings are not supported in Batch Mode and even though your query will make expectations on running well, it will be executed in the Row Mode and if you dare to mix it with other Aggregate operations, you will be punished with the DOP 1 for the query. Yes, the Clustered Columnstore Index Scan runs with the Batch Execution Mode, but what about the Hash Match iterator, that is expected to have spent 95% of the query execution resources ? Single core execution with spilling sort iterator ? 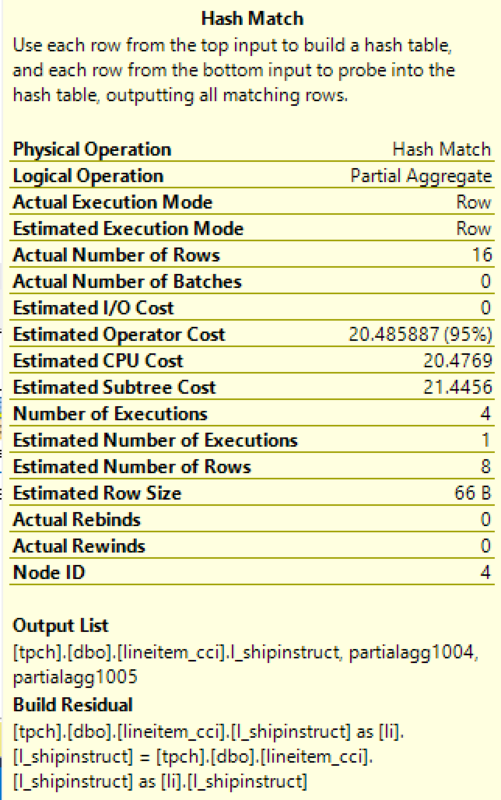 Even though the Stream Aggregate iterator is showing 8% of the resources cost, it is being executed within the Row Execution Mode, because of the way that the MAX String Aggregate is implemented. The reason for all this troubles ? Mixing String Aggregates with the other Aggregates. Well, but the client wants this query to be executed FAST, is there a solution for this ? Like with the most limitations of such type, the typical approach I use is to split the conflicting parts into the separate subqueries and pivot back the results, because every single aggression by itself functions well or reasonable well (Look at the begin of this subchapter on how the Row Execution Mode is headlining the String Aggregations). There are definitely some limitations and bugs within the Columnstore Indexes and the Batch Execution Mode (breaking news – like with any other software that me & you, dear reader, are writing), but knowing the team working on this technology – I have no doubt that they will be further improving the current limitations. In the mean time there are workarounds which are not too difficult to implement and they offer easy solutions for the described problems. The whole query DOP 1 or just a region? Weird product limitation. I believe this is a whole query limitation. This is a kind of a bug that hopefully will be fixed soon.